In describing the system of wires that comprises the Internet, Neal Stephenson once compared the earth to a computer motherboard. From telephone poles suspending bundles of cable to signs posted warning of buried fiber optic lines, we are surrounded by evidence that at a basic level, the Internet is really just a spaghetti-work of really long wires. But what we see is just a small part of the physical makeup of the net. The rest of it can be found in the coldest depths of the ocean. 75% of faults are due to external aggression -- the majority through human activity such as fishing, and ship's anchors. There are also geological factors such as sub-sea earthquakes and landslides, shifting tectonic plates and typhoons.During the 2011 tsunami in Japan about half of their cables had outages, but the operators were able to reroute capacity to other routes, so Japan held up very well. Last spring, there was damage in Mediterranean cables that linked East Africa to Europe. But it was many years ago that there was last a complete blackout. The last cable across the Pacific cost $300 million; one cable that entered service last year in Asia reaching many locations cost $400 million. The cost is largely due to length but also how much it is on land. A complicated cable that lands in 10 different countries with thousands of kilometers per link will cost much more than one linking just two points. 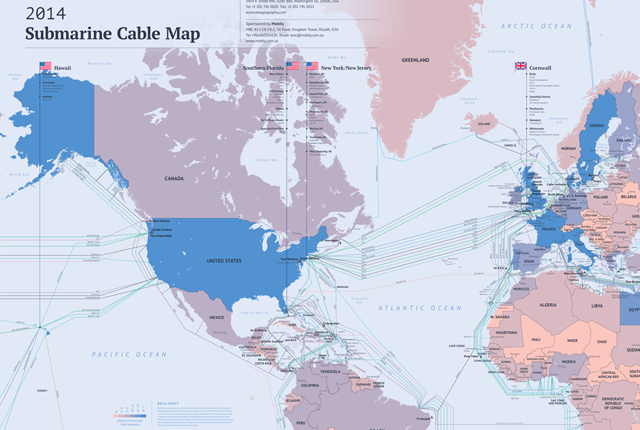 Here are 10 things you might not know about the Internet’s system of undersea cables. 1. CABLE INSTALLATION IS SLOW, TEDIOUS, EXPENSIVE WORK. Ninety-nine percent of international data is transmitted by wires at the bottom of the ocean called submarine communications cables. In total, they are hundreds of thousands of miles long and can be as deep as Everest Is tall. The cables are installed by special boats called cable-layers. It’s more than a matter of dropping wires with anvils attached to them—the cables must generally be run across flat surfaces of the ocean floor, and care is taken to avoid coral reefs, sunken ships, fish beds, and other ecological habitats and general obstructions. The diameter of a shallow water cable is about the same as a soda can, while deep water cables are much thinner—about the size of a Magic Marker. The size difference is related to simple vulnerability—there’s not much going on 8,000 feet below sea level; consequently, there’s less need for galvanized shielding wire. Cables located at shallow depths are buried beneath the ocean floor using high pressure water jets. Though per-mile prices for installation change depending on total length and destination, running a cable across the ocean invariably costs hundreds of millions of dollars. 2. SHARKS ARE TRYING TO EAT THE INTERNET. There’s disagreement as to why, exactly, sharks like gnawing on submarine communications cables. Maybe it has something to do with electromagnetic fields. Maybe they’re just curious. Maybe they’re trying to disrupt our communications infrastructure before mounting a land-based assault. (My theory.) The point remains that sharks are chewing on the Internet, and sometimes damage it. In response, companies such as Google are shielding their cables inshark-proof wire wrappers. 3. THE INTERNET IS AS VULNERABLE UNDERWATER AS IT IS UNDERGROUND. It seems like every couple of years, some well-meaning construction worker puts his bulldozer in gear and kills Netflix for the whole continent. While the ocean is free of construction equipment that might otherwise combine to form Devastator, there are many ongoing aquatic threats to the submarine cables. Sharks aside, the Internet is ever at risk of being disrupted byboat anchors, trawling by fishing vessels, and natural disasters. A Toronto-based company has proposed running a cable through the Arctic that connects Tokyo and London. This was previously considered impossible, but climate change and the melting ice caps have moved the proposal firmly into the doable-but-really-expensive category. 4. CONNECTING THE WORLD THROUGH UNDERSEA CABLES ISN’T EXACTLY NEW. In 1854, installation began on the first transatlantic telegraph cable, which connected Newfoundland and Ireland. Four years later the first transmission was sent, reading: “Laws, Whitehouse received five minutes signal. Coil signals too weak to relay. Try drive slow and regular. I have put intermediate pulley. Reply by coils.” This is, admittedly, not very inspiring. (“Whitehouse” referred to Wildman Whitehouse, the chief electrician of the Atlantic Telegraph Company, who we’ve discussed previously.) For historical context: During those four years of cable construction, Charles Dickens was still writing novels; Walt Whitman published Leaves of Grass; a small settlement called Dallas was formally incorporated in Texas; and Abraham Lincoln, candidate for the U.S. Senate, gave his “House Divided” speech. 5. SPIES LOVE UNDERWATER CABLES. During the height of the Cold War, the USSR often transmitted weakly encoded messages between two of its major naval bases. Strong encryption was a bother—and also overkill—thought Soviet officers, as the bases were directly linked by an undersea cable located in sensor-laden Soviet territorial waters. No way would the Americans risk World War III by trying to somehow access and tap that cable. They didn’t count on the U.S.S. Halibut, a specially fitted submarine capable of slipping by Soviet defenses. The American submarine found the cable and installed a giant wiretap, returning monthly to gather the transmissions it had recorded. This operation, called IVY BELLS, was later compromised by a former NSA analyst named Ronald Pelton, who sold information on the mission to the Soviets. Today, tapping submarine communications cables is standard operating procedure for spy agencies. 6. GOVERNMENTS ARE TURNING TO SUBMARINE CABLES TO AVOID SAID SPIES. With respect to electronic espionage, one big advantage held by the United States is the key role its scientists, engineers, and corporations played in inventing and building large parts of the global telecommunications infrastructure. Major lines of data tend to cross into American borders and territorial water, making wiretapping a breeze, relatively speaking. When documents stolen by former NSA analyst Edward Snowden came to light, many countries were outraged to learn the extent to which American spy agencies were intercepting foreign data. As a result, some countries are reconsidering the infrastructure of the Internet itself. Brazil, for example, has launched a project to build a submarine communications cable to Portugal that not only bypasses the United States entirely, but also specifically excludes U.S. companies from involvement. 7. SUBMARINE COMMUNICATIONS CABLES ARE FASTER AND CHEAPER THAN SATELLITES. There are well over a thousand satellites in orbit, we’re landing probes on comets, and we’re planning missions to Mars. We’re living in the future! It just seems self-evident that space would be a better way to virtually “wire” the Internet than our current method of running really long cables-slash-shark-buffets along the ocean floor. Surely satellites would be better than a technology invented before the invention of the telephone—right? As it turns out, no. (Or at least, not yet.) Though fiber optic cables and communications satellites were both developed in the 1960s, satellites have a two-fold problem: latency and bit loss. Sending and receiving signals to and from space takes time. Meanwhile, researchers have developed optical fibers that can transmit information at 99.7% the speed of light. For an idea of what the Internet would be like without undersea cables, visit Antarctica, the only continent without a physical connection to the net. The continent relies on satellites, and bandwidth is at a premium, which is no small problem when one considers the important, data-intensive climate research underway. Today, Antarctic research stations produce more data than they can transmitthrough space. 8. FORGET CYBER-WARFARE—TO REALLY CRIPPLE THE INTERNET, YOU NEED SCUBA GEAR AND A PAIR OF WIRE CUTTERS. The good news is that it’s hard to cut through a submarine communications cable, if only because of the thousands of very lethal volts running through each of them. The bad news is that it is possible, as seen in Egypt in 2013. There, just north of Alexandria, men in wetsuits were apprehended having intentionally cut through the South-East-Asia-Middle-East-West-Europe 4 cable, which runs 12,500 miles and connects three continents. Internet speeds in Egypt were crippled by 60% until the line could be repaired. 9. UNDERWATER CABLES ARE NOT EASY TO REPAIR, BUT AFTER 150 YEARS, WE’VE LEARNED A TRICK OR TWO. If you think replacing that one Ethernet cable you can’t quite reach behind your desk is a pain, try replacing a solid, broken garden hose at the bottom of the ocean. 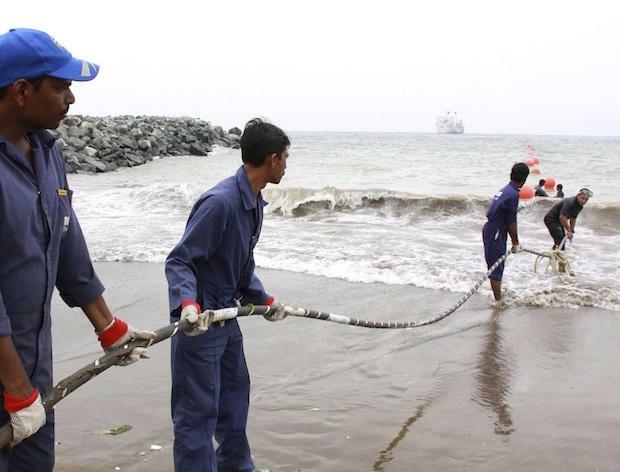 When a submarine cable is damaged, special repair ships are dispatched. If the cable is located in shallow waters, robots are deployed to grab the cable and haul it to the surface. If the cable is in deep waters (6,500 feet or greater), the ships lower specially designed grapnels that grab onto the cable and hoist it up for mending. To make things easier, grapnels sometimes cut the damaged cable in two, and repair ships raise each end separately for patching above the water. 10. THE INTERNET’S UNDERSEA BACKBONE IS BUILT TO LAST FOR 25 YEARS. As of 2014, there are 285 communications cables at the bottom of the ocean, and 22 of them are not yet in use. These are called “dark cables.” (Once they’re switched on, they’re said to be “lit.”) Submarine cables have a life expectancy of 25 years, during which time they are considered economically viable from a capacity standpoint. Over the last decade, however, global data consumption has exploded. In 2013, Internet traffic was 5 gigabytes per capita; this number is expected to reach 14 gigabytes per capita by 2018. Such an increase would obviously pose a capacity problem and require more frequent cable upgrades. However, new techniques in phase modulation and improvements in submarine line terminal equipment (SLTE) have boosted capacity in some places by as much as 8000%. The wires we have are more than ready for the traffic to come. These are indeed interesting facts about undersea internet cables. We are more used to the land cables, this is a topic that students from site that can write your essay can discuss over dinner.